Yep, it's the holidays, so what am I doing? Working on the next books coming out. That was, of course, after getting Q3 royalties out to the authors, editors and artists, and looking in despair at my own writing. My managing editor and I have taken to sending each other emails even though we sit less than 5 feet from each other in our great room about the current books. Not that we aren't talking; we just have to have things in writing so no one goes nuts over something misinterpreted. I've been finishing the final print format for 2012: Midnight at Spanish Gardens. The print formats for Modern Sorcery and Spanish Gardens required a crash course in Adobe InDesign and there have been some long nights into the wee hours of the morning where I was pretty sure that pounding my head into the monitor would've been a good thing. Modern Sorcery had some format goofs we caught, so it is in the final proof. But they're both off at the printers and almost ready for purchase. Yay! On the new book side, we have two books in January! One, the Anthology, The Feather's Edge, edited by Deborah Ross, is a collection of new swashbuckling stories by Kari Sperring, Tanith Lee, Sherwood Smith, among other notable fantasy authors. The other is Embers of Heaven, by Alma Alexander, the sequel to her bestselling novel, The Secrets of Jin-shei . I'll let you know when those come out. In the meantime, I hope you had a Merry Christmas, Happy Hanukkah, Happy Solstice, Happy Kwanza, or whatever you celebrate, or don't. Be sure to have a safe and happy new year. 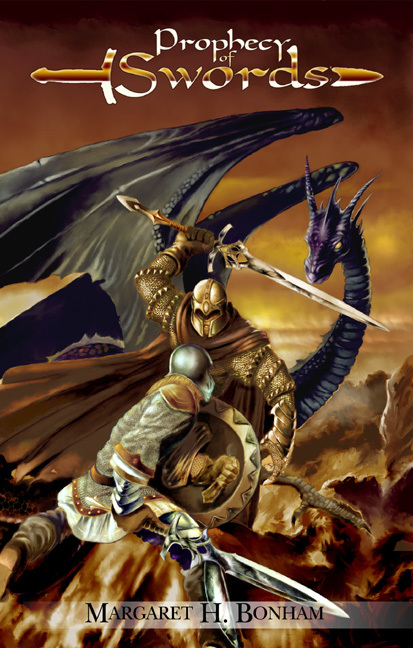 Prophecy of Swords #free on #Amazon #Kindle! Great news! From December 27 through 29th, get Prophecy of Swords (Swords of Destiny) free on Amazon! That's right, I'm giving away the book to Amazon customers for three days. So, check it out, and download your very own copy. Get your own and let others know about this great deal! Normally, $2.99, but now free for the next three days! There's an old joke that goes "How do you eat an elephant?" The answer is "One bite at a time." While it may seem a silly notion, if you substitute "novel" for "elephant," "write" for "eat," and "word" for "bite," you pretty much get the answer for how to write a novel. When you think about it, writing novels are a daunting task, but the reality is that sometimes you really do "bite off more than you can chew." That has been happening to me lately with my book, Web of Wyrd. You see, at some point, I was trying to put too much in, the proverbial stuffing 50 lbs of crap in a 5 lb sack. Web of Wyrd has languished at about 80,000 words since sometime around 2003. It sat unfinished and unloved mainly because every time I looked at it, I despaired. I had other books to write and other things to do, but I knew I had to go back to it someday. The problem was one of success, however. Namely, Prophecy of Swords became a Kindle bestseller. Then, Runestone of Teiwas started doing well. I realized I had to get my next book out. Being a publisher, I know the need for timing. The time is somewhat past, but the book should still get out there. But the mess remained. Going through the book, I realized what was causing problems was portion control. Basically, like Runestone, its predecessor, I was trying to fit too much into a 115,000 word book. Oh sure, I could come up with one of those ungainly tomes that we see fantasy novels fill, but I really didn't want that. So, I had to scale back, and I had to start cutting subplots. So, what does all this mean and how does that apply to your fiction? As a writer, your should first think in terms of small steps. That means writing something every day, even if it's daunting. Even if it's not much. Some days I write very little. Nowadays it's harder to write. But I figure I have to take it a step at a time. Anne Lamott, who wrote the book Bird by Bird recommends this. Some books are naturally behemoths, but for this publisher, I really prefer a nice size of 100K give or take. That means you've got to make some hard decisions. If your book is going upwards of 200K, maybe you have too many subplots, you're too wordy, or (koff) your book is too convoluted. If it makes sense to keep it at that size, see if you can split it up at a logical point. From a marketing standpoint, you'll make more money from small press with three books than one big one. Plus you'll have three books out. What a concept. So, I'm looking at Web of Wyrd and realizing that I'm cramming in too much and need to push some more off to later books. Some subplots can keep until later. Clean up what is already there. Define the plot and resolution. And be glad when I finish the book. 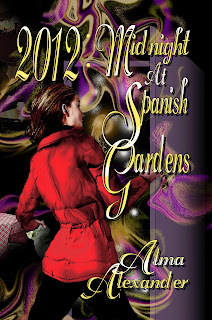 Yesterday, I got an email from the Tiptree Awards folks asking for me to send copies of Alma Alexander's book, 2012: Midnight at Spanish Gardens for consideration of the award. It appears that it was recommended for the Tiptree Award, which is simply amazing because we're a new press and while Alma certainly isn't a new author, it is still an awesome achievement. Congrats, Alma!